When you’re looking to celebrate a special event in style, limo hire Wolverhampton could be just what you need. One of the most impressive and oldest limos on offer is the Lincoln Stretch limousine. This extra-long limo is what you typically picture when you think about limo hire. Our Lincoln model has a wave attitude design where everything inside the car is wave shaped. This helps to create a fun, relaxed atmosphere. Most of our limos feature mood lighting and colour changing lights. Whether you want a limo for your wedding or an anniversary, we have a package to suit your needs. Want something to add a bit more class to your wedding day, but need a range of vehicles to choose from? We can offer a variety that many others can’t. Our wedding car hire options range from vintage convertibles to modern saloons, our fleet of wedding cars in Wolverhampton is one of the best. The Hummer limousine is perfect for nights out, proms and even weddings. If you are looking for wedding transportation that offers something unique then the Hummer could be a great choice. Two of our models are perfect for weddings. The standard White Hummer has a traditional style with a modern twist. However if you want something extravagant that will really stand out on your special day then opt for Pink hummer limo hire Wolverhampton. All eyes will definitely be on you as you pull up outside the venue in a chauffeur driven Pink Hummer! Hummer limos are popular for a wide range of events. The party bus hasn’t been around very long but it is already one of our most popular services. When you choose party bus hire Wolverhampton, there are various things that you need to be aware of. It is often referred to as a club on wheels. This is because it has an impressive sound system, a dance pole and plenty of on-board entertainment. You literally don’t have to step foot outside the party bus to have a good time. We are proud to offer you the most competitive prices in Wolverhampton. Party bus hire can be very expensive, which is why it is better to hire this vehicle if you are travelling with a large group of friends. The bus will seat up to 16 passengers. There are many places that you could hold an event in Wolverhampton for weddings, anniversaries and birthdays, including Perton Park Golf Club, Hilton Hall and Wolverhampton Racecourse. Our Rolls Royce hire cars are popular for weddings, especially in Wolverhampton and its surrounding areas. We have different Rolls Royce models to offer, including the Phantom which we have in White and Silver, the Ghost and Drophead Convertible. Each has unique looks, luxurious leathers and style. So if Phantom car hire is something you are interested in, you can get in touch with us today. Looking for a company that offers a great range of Bentley hire cars, great customer service and packages? Then you’ve come to the right place as Finishing Touch Cars can offer all of these. 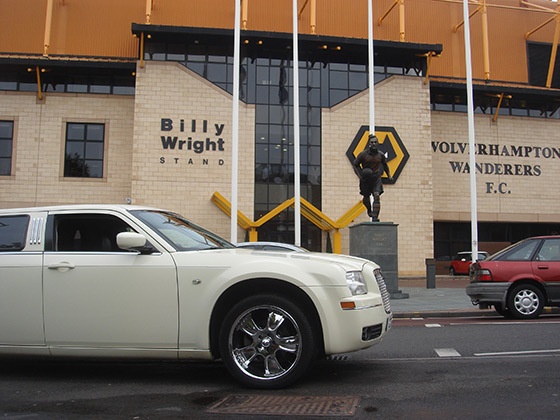 We have one of the biggest fleets in the Wolverhampton area, which includes our range of Bentley hire cars too. The Bentley models we have are the Flying Spur, Arnage and Mulsanne. Each Bentley hire car can offer comfort, style and luxury to each who hire it for their special occasion, and we’ve had many satisfied customers too. Wolverhampton started out as a market town and it is now one of the largest cities within the West Midlands. It used to be well known for its woollen trade industry. Throughout the Industrial Revolution, the city became a huge industrial centre producing steel, motorcycles and locks. These days the main industries associated with Wolverhampton are the service sector and engineering. Many famous bands and artists have come out of Wolverhampton including Slade, Babylon Zoo and Cornershop. There are many live music venues in and around the city and you are always guaranteed a great night out no matter what time of year you visit. 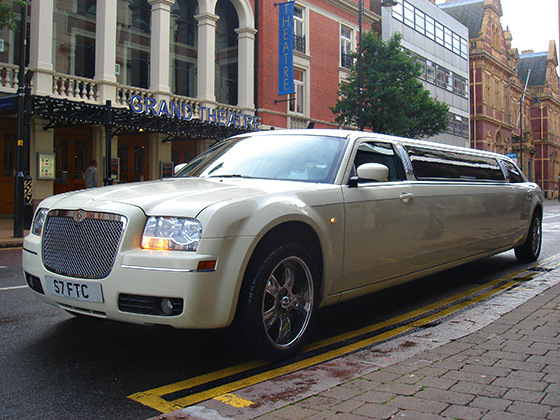 If you want to enjoy a stress free night out in the city then why not make use of limo hire Wolverhampton? Many people travel to Wolverhampton to get married. Wedding venues such as the Country House and The Mount Hotel prove popular with modern style weddings. Make use of affordable wedding limos Wolverhampton by calling Finishing Touch Cars today. 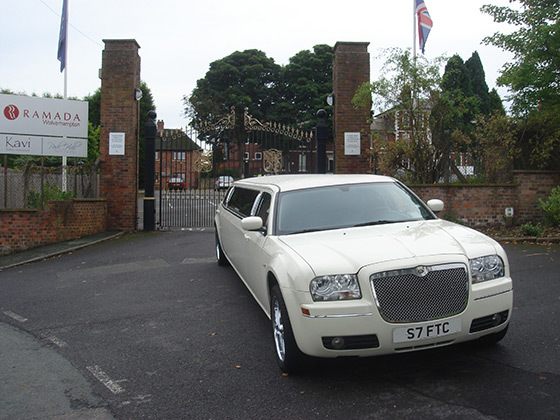 We have a range of limos and wedding cars available for hire. It doesn’t matter what your reasons are for travelling to Wolverhampton, limo hire is definitely the best way to explore this fantastic city. Wolverhampton – We cover many of the areas near Wolverhampton such as Bilston, Darlaston, Bushbury, Tettenhall, Willenhall, Goldthorn Hill, Penn, Wednesfield and Codsall. Planning a wedding has its positive and negative moments, like remembering to get everything and to book venues, suites, food and cars. We’re here to help give you some advice on some of the venues we think are the best in the Wolverhampton area, whether you want a small, quiet wedding or a large, luxurious one, it’s down to you to decide. Wolverhampton Registry Office is located in the Civic Centre, St Peter’s Square – please be aware when planning route as there are many one way streets. There are also two post codes for the registry office – one will take you to the back entrance, the other will take you to the front (where you want to be!). If you want photographs, there is the ideal West Park located nearby. You even have a choice of wedding venues locally to hold your reception, which include the Britannia Hotel, Heera Banqueting Suite and Patshull Hall. Trying to find a venue that is steeped in history, has beautiful grounds and somewhere that you can have both your wedding and reception at? Look no further! The Ramada Park Hall Hotel is a Grade II listed Georgian building situated in 5 acres of grounds, originally home to the noble family of Dudley and Ward up until 1757. In 2011, the hotel was taken over, and the owners have invested to upgrade the facilities to make it into one of the best hotels in Wolverhampton. Easily accessible from the M54, M5 and M6 motorways, it is only a short journey from Wolverhampton city centre, Dudley and Telford. Then again if you’re looking for somewhere with lots of character and charm, then take a look around the Mount Hotel. Just minutes away from Wolverhampton city centre, it is situated in 4 acres of stunning parklands which gives you the feel of both countryside and city life. The Grade II listed building has been restored to 3 star standards while retaining many of its original features it has to offer, and each room is steeped in modern comforts while keeping its 19th century style. The Mount offers free parking and easy access to major road networks, which would make it ideal if you were to have your wedding here. You or your kids love spending time spending money, take them to Wolverhampton City Centre! It is an attractive shopping destination complete with both big name stores and independent shops. It even has the Wulfrun Shopping Centre, lively indoor and outdoor markets, which gives the city centre more to offer, with over 700 shops including 300 independent retailers and the famous House of Fraser Department Store with its wide range if brands. The Grand Theatre is said to be one of the best examples of Victorian architecture in the Wolverhampton city today, and many people would agree. Its £10,000 construction began on the 28th June 1894, and was designed by theatre architect Charles J Phipps and builder Henry Gough. Its first, debut production was by the world-renowned D’Oyly Carte Opera Company, who performed to the 2,151 capacity of the original auditorium layout. On The Grand Theatre’s 100th birthday in December 1994, the very same D’Oyly Carte Opera Company did a special, one-off performance. Still on-going with its theatre performances today, why not take the family to see Swan Lake or even The Sensational 60’s Experience! Monmore Green Greyhound Stadium, Wolverhampton. A great night out for all the family of live dog racing. There are three bars to enable you to enjoy a drink in between races and also a trackside restaurant if you wish to watch the racing indoors while enjoying a meal. The new Party Pack Bar can be used as a function room for private parties, business events etc. and the ideal accompaniment to all this is a journey there in a stretch Limousine. The Civic Hall, Wolverhampton boasts some of the best venues historically recorded in the UK. From student fests, club nights to comedy acts and a wide variety of music acts including classical concerts to rock stars. There is something to suit every taste. With a bar open before the performance and during intervals it can make for a special night out. Make a night of it and enjoy a party before you get there in our Party Bus. Walkabout, Wolverhampton. The place to be for that party night out. Airport Thursdays provide music from all around the world. Paparazzi Fridays and Full on Saturdays with top DJs, with special offers on drinks throughout the night and the new Comedy Club early Saturday evenings this venue provides a fun packed night out. The way to start a fun packed night out is in a fun Party Bus or a more sophisticated Limo or Hummer and then have a return journey home too so you can enjoy the night without worrying how you are getting home. Pink Limousine Hire is the latest craze in the limo hire industry, especially in Wolverhampton. This craze is popular with young girls, women and hen parties. Are you looking for wedding limos Wolverhampton? There are lots of different models to choose from so you should always find something to suit your special day. 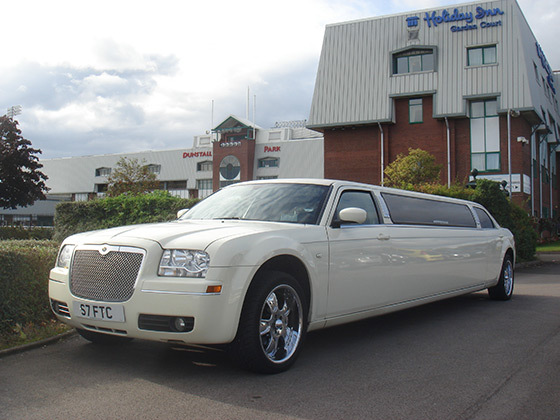 From the Hummer to the Baby Bentley; we have a limo to suit every style of wedding.